How are you feeling about the upcoming return to school? I’ve enjoyed spending time with my kids and I’ve had a house full of them and their friends throughout January (I actually did a tally and I’ve had a total of 34 different kids pass through my doors!) – it’s been nice to listen to them all play and get to know the personalities of my children’s friends. But the prospect of the return to routines and of empty lunchboxes staring at me every morning does fill me with a bit of dread. As always, I’ll turn to my Lunchbox planner, which has 40 weeks of plans which takes some of the thinking out of it! I keep everything pretty simple, but throw in a weekly recipe and use lots of seasonal fruit and veg to keep things interesting. You can buy a copy of the e-book here. There’s been a bunch of great posts around lately full of back to school ideas and advice. 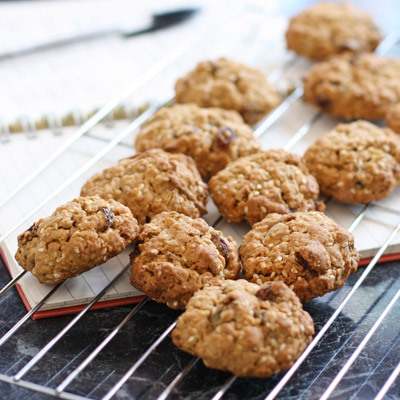 I liked this post from Natural New Age Mum with biscuit ideas – they all look great! At the moment I’m working on a new quick-bake e-book and here’s a little preview. It’s another biscuit suggestion that pops a bit of fibre into the lunchbox and gives them some energy for the afternoon session. Best wishes to all of those sending off your kids for the first time. I did that last year, and it was extremely bittersweet. This year is much more relaxed, there are no nerves, just excitement about which class we’ll be in with which friends. What a difference 12 months makes! Biscuits. They make me happy. Sift the flour into a medium sized bowl. Mix in the oats, bran, seeds, cinnamon, salt and sultanas. In a separate, larger bowl, use hand-held beaters to combine the butter and sugar until creamy. Add the egg and mix well. Use a spoon to fold in the dry ingredients. Pop on kitchen gloves to avoid mess and roll out ping-pong sized balls of mixture. Place on the trays and bake for 12-15 minutes until just brown. Thanks for the recipe – they look great! Do you know if you can freeze these biscuits? I wouldn’t freeze these ones – much better fresh. They do keep for 3-4 days in an airtight container. Would this work with other cereal instead of all bran? Is that the noodly one or a flakey one? Made a slight variation this today, came out great, thanks for the recipe! Just made these as a spur of the moment thing and all I had on hand was the Honey Almond All Bran (flakes). It seems to have worked out really well (not having the original kind to compare to) and they are very tasty. We are not allowed to send sesame seeds to school because of their proximity to peanuts. Might be worth checking. really? Interesting. Similar proteins I guess.